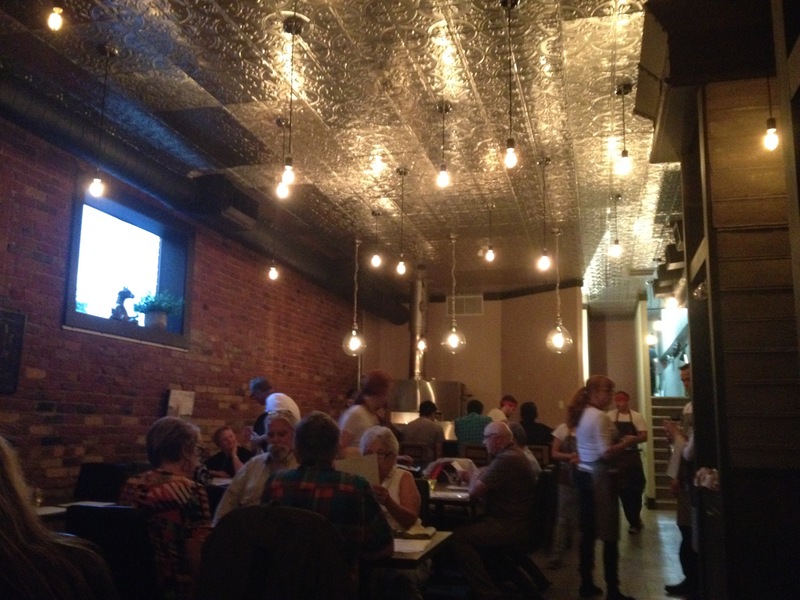 Join Hamilton Food Tours and explore downtown Hamilton’s unique restaurants and historic neighbourhoods. Lake Road Restaurant on James St. N.
Chef Dan Megna and Laurie Lilliman opened their latest culinary venture, Lake Road Restaurant last night to an excited crowd. The restaurant did not disappoint. Many of the eager patrons were former guests at the duo’s other incredibly successful restaurant, Twisted Lemon in Cayuga. UPDATE: We’ve revisited Lake Road to try some more dishes, continue reading! The venue is gorgeous, the food is impeccable and the theme is decidedly more understated than Twisted Lemon. The wait staff wore jeans, white shirts and aprons adding to the casual vibe. My family and I shared a few dishes including a margherita pizza, pasta and the Napoleon appetizer which included hummus, carrot-Harissa puree, baby Ghanoush and tzatziki. Everything was delicious. I also purchased three bags of their famous Lemon Twists to enjoy later (highly addictive!). We’ve revisited Lake Road and tried more items from the menu. The Greek Salad was amazing with the marinated feta and black olive paint on the side. It was such a beautiful plate that was equally as tasty as it looked. The soup du jour was a roasted red pepper. The Chef’s risotto of the day featured scallops, shrimp and tarragon. With everything being so delicious, we couldn’t help but order dessert. And last but not least, the Citrus! Delicious macarons with spring flavours from @nuttybuttercafe - have you been there yet? Let us know! We're really liking their blossom surprise flavour! #turmericlatte kind of day @emeraldcoffeeco. That lemon cookie... so good you'll forget to take a pic before you bite into it. Come get some on our tour this Saturday! Still 4 tickets left! Since 2015 our goal has been to highlight the community and vibrant food scene by bringing people downtown to interact with businesses in an informative and fun way. We are so excited for you to join us!